This is a recipe that was invented by my wonderful mother – a combination of a Dutch Chocolate Chip Cake that my Auntie Gladys used to made and a Pecan Oatmeal Cake that my mom found in the Congressional Cookbook that she got as a wedding gift over 35 years ago. The marriage of these two recipes has created a cake that is a long-time favorite in our family. 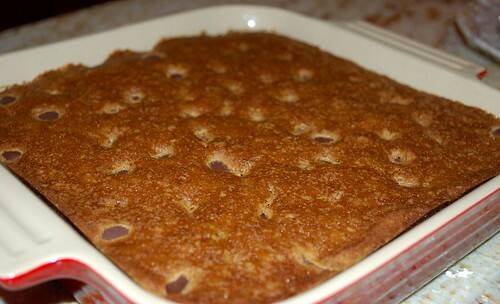 This cake is super-moist because the oatmeal is soaked in boiling water before it is added to the batter. 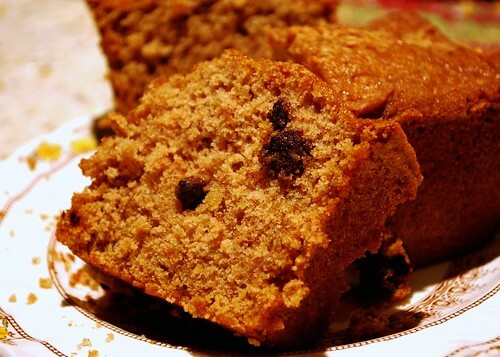 Also, it has JUST the RIGHT amount of chocolate chips – not to few, not too many – so that you can appreciate the chocolate AND the oatmeal cake. The tiny hint of cinnamon really brings the flavors together. It travels well, freezes well, and it is the staple baked good that mom used to send us in our care packages at college because it stays good for so long. I hope you all enjoy it as much as we do! Preheat oven to 325 degrees. Grease a 9×13 inch cake pan and set aside. Put oats in medium bowl. 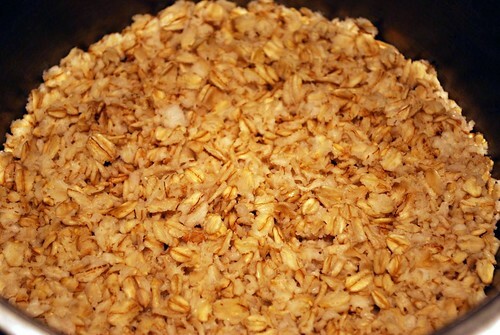 Pour boiling water over the oats. Cover and allow to stand for 20 minutes. In another medium bowl, combine dry ingredients and set aside. With an electric mixer, combine butter, sugars, and eggs. Beat until fluffy. Next, with the mixer on low, add alternately the dry ingredients and the oatmeal – starting and ending with the dry ingredients. Mix until thoroughly combined. Sprinkle 1 teaspoon flour over 1/2 cup chocolat echips in a small bowl and toss until coated (this will help prevent them from sinking). Add these to the batter and stir until evenly distributed. 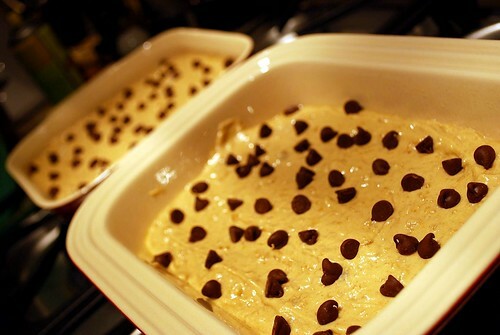 Pour batter into prepared pan and sprinkle remaining 1/2 cup chocolate chips over the top. 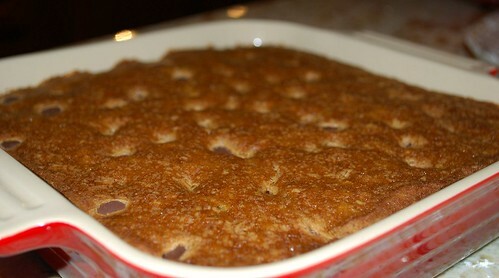 Bake in preheated oven about 45-50 minutes, or until toothpick inserted into the center of the cake comes out clean.